As one of the UK’s leading staircase designers, we’re constantly being inspired by our surroundings. We’ve already shown you how we collect our everyday inspirations together into mood boards, be it fabric samples, a photograph or even just a colour sample. But we also wanted to showcase the best examples of work we see from other designers in the industry. Our new ‘Design Ideas’ page collates all of our favourite designs that we’ve come across when perusing Pinterest or browsing Houzz. Whether it’s a clever storage solution or an interesting sculptural element, you’ll find no shortage of inspiration on this page. If something catches your eye, you can just click on the image to pin it to your own individual boards. Whilst design is very much image led, sometimes you need a little more information and words become necessary! So as well as collecting together all of the visuals that inspire us, the new Inspiration page also has the added functionality to group together all of our ‘inspiration’ blog articles. 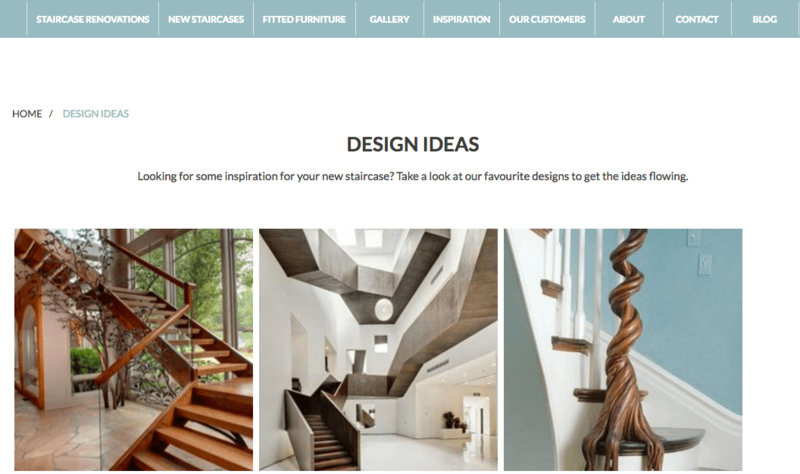 If you’re considering a new staircase but aren’t quite at the decision making phase yet, this is the perfect place for you to browse and to get a better idea of what can be achieved in your space. If you’re feeling inspired by these examples of staircase design, get in touch with our team today to discuss your options.